Henriette, Laura, Adèle, Rose, in their black hats and second-best heavy coats and sturdy shoes, pick their way across the snow-covered rough soil to the new wooden crosses where the letters are still crisply but quickly carved, dressed with rough wreaths. They are accompanied by with a couple of older men, maybe their fathers or uncles. One of the men has a camera. Henriette takes her gloves off, cautiously touches the letters. She needs to feel. The crude wood, unmilled by the stinging wind, grazes her tender fingers which are already frozen. There is still debris scattered round the scraped-out, heaped up graves, carefully brushed into mounds of crushed rocks. Here and there a pile of small stones, thrown up in the torn-up landscape, randomly litters the flat, bare clearing, scraped out among a bit of scrub. Laura and Rose, Adèle in between them, awed, step carefully to the edge of the rounded grave. Under the snow, the soil is raw and bleeding. It is land which has been catastrophically damaged. The remains of the wood are uncompromisingly silent as far as the crest of wounded mountain. Adèle, Rose, Henriette and Laura need to try to revive the scenes that their men knew. In the bleak finality of the landscape, they can see the finality of death. Bodies have been lifted from the place where their last minutes of life ebbed away and transferred to embryonic graves and the soil left rough. The rubble has been blanketed in mud, the wire and debris sucked under the surface. There is nothing at all alive to see, not a healthy tree, not a deer, not even a rabbit. The defiled earth is as dead as eyes. See their faces. Henriette’s is impassive. The others look down at the rounded grave, overpowered and dazed by memories and imagination. The mounds have been built over bones. The Col is a wasted landscape into which thousands of human bones have been poured, pulverised and smashed apart, smothered by the tactile crush of the soil, and mingling with this putrefying discarded humanity are the brass pieces of patriotic optimism, the buttons, the badges, to be dredged up by scavenging charlatans and sold along with the rest of men’s belongings, their cups and forks and plates and razors and spanners and soap tins, to those who will call themselves collectors. I wonder what closure Henriette and Rose, Laura and Adèle will take from their visit. I see them walking down the overgrown and crumbled street of a Vosgien village, where the houses are still bleak, burned shells, and the trees are gaunt, torn stumps. Her pilgrimage over, Henriette will soon return to her shop. The man takes a photograph. I wonder how torn and anguished he feels as he looks through the viewfinder. Rose, or Henriette, or Laura, or Adèle, has permitted the photographs to be sold, to be carefully written by men or mourners in a frantic hand with a pencil or a neat hand with a fountain pen. They’ll never be the iconic photos which are reproduced in books and seen by thousands, but the sepia secret caches which will become a family’s collection. Each woman has papered the rawest images onto the wall of memories in her mind. Those are too harrowing to reveal. The women make a few francs from allowing their grief to be sold. It will do. The darkness will come again soon enough. Col de la Chipotte, near Raon l’Étape, Vosges, was known as le trou d’enfer to the French soldiers in the terrible combat over this vital route in August 1914. 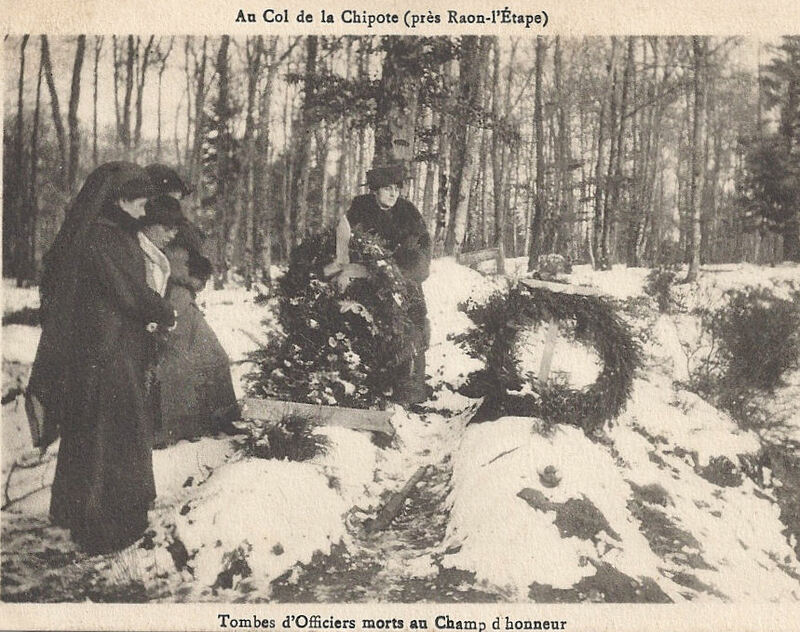 The card: The writer told “Ma chère Henriette” to “Put the card in your album and save it because at la Col de la Chipotte 19000 men, French and German, fell and they are buried in the same graves.” (I’m not sure he has the number accurate, but the casualties at Col de la Chipotte were vast: 4000 French dead and a greater number of Germans.) He goes on to exhort her that nothing, not even fire, must close the shop, which I presume is their business. He signs off with his love. The interpretation is mine and wholly fictional.